Electronic Waste is a Wildlife Problem! Electronic waste is a problem. 1.5 billion cell phones are purchased annually. That is one for every five people on the planet and they don’t last forever. A United Nations study found that 44.7 million tons - that is TONS - of e-waste is discarded annually, but only 20% of that was disposed of properly. The plastics, glass, metal, and even gold, in these devices can be reclaimed and recycled. Apple alone recovered 2,204 pounds of gold from recycled phones in 2015. That gold was worth $40 million dollars. Our electronic devices also contain toxic materials such as lead, mercury, and cadmium which must be disposed of properly and not in your garbage and the local landfill or our waterways. These materials are a serious threat to your health and to the health of wildlife. Amador County schedules regular dates for recycling common household hazardous waste products such as computers, cell phones, and other e-waste and hazardous waste. Check the schedule for a convenient date - https://www.amadorgov.org/home/showdocument?id=28662. Lowes has drop off bins for recycling rechargeable batteries as well as light bulbs. 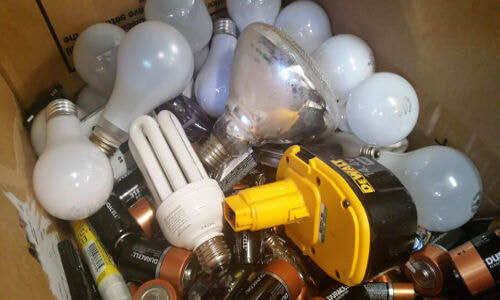 Go through your garage, grab all the no-longer-used rechargeable batteries and CFL bulbs and take them to Lowes. Many tech companies will take back your old device when you buy a new one. Apple offers gift cards for qualifying products. And if your device does not qualify, they will still take it back and recycle. Best Buy will take electronics and appliances even if you did not buy them there. Sprint has a buyback program worth up to $300 for mobile phones from any carrier. Amazon, Office Depot, Staples, Epson, HP all have recycling programs. So let’s do better. Keep e-waste out of the landfill, out of the oceans; don’t let it harm your health or wildlife’s health. Tri County Wildlife Care, a local nonprofit started in 1994, is dedicated to the rescue and rehabilitation of our native wildlife and helping our community live in balance with wildlife. They envision a world where wildlife and people thrive together. For more information call (209) 283-3245, or visit pawspartners.org.